Have you ever tried to persevere in a difficult task without a clear purpose or objective? It’s unnerving, and discouragement always lurks about when we don’t know where we’re heading or why. Without purpose, our effort toward any finish line rests on our moment-by-moment feelings. Life doesn’t always feel purposeful, and the clarity for that purpose isn’t always at our fingertips day to day. Who made me? Why am I here? What is my purpose? These are questions that each of us asks when everyday rhythms feel monotonous and insignificant—or when life’s crossroads seem too significant, and we stretch to understand how we fit. But for this purpose I have raised you up, to show you my power, so that my name may be proclaimed in all the earth (Exodus 9:16). Instead of finding our purpose in hoarding the best of this life on earth for our own pleasure within it, we’ve been freely given the best of eternal life through communion with Christ and His great pleasure in us. None of these positions of purpose can exist apart from God’s provision to fulfill them. You and I have purpose today because He declares it. In the most mundane and the most magical seasons alike, our purpose does not change. To glorify Him by loving Him… to glorify Him because we love Him. at your right hand are pleasures forevermore (Psalm 16:11). 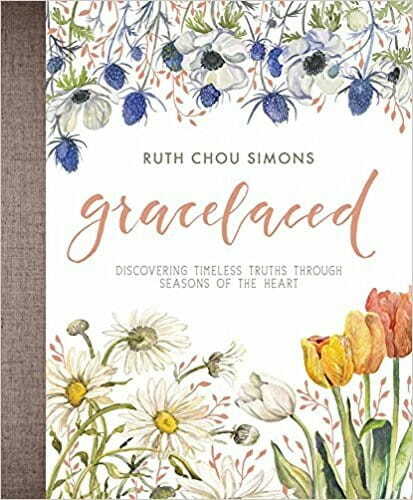 Excerpted from GraceLaced by Ruth Chou Simons. ©2017 by Ruth Chou Simons. Published by Harvest House Publishers. Ruth Chou Simons is an artist, writer, entrepreneur, and speaker. As creator of the popular GraceLaced online shoppe, blog, and Instagram community, she shares scriptural truths daily through her hand-painted artwork and words. Ruth and her husband, Troy, live in New Mexico and are grateful parents to six sons—their greatest adventure.